Learning Gems is a team of programmers, school teachers, graphic designers and copywriters who are passionate about making learning fun by creating educational apps for kids. In a world where technology is always at our fingertips, we aim to bring education to your children one playful app at a time. 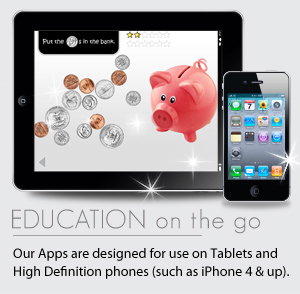 We focus on the common core curriculum and create apps that you will encourage your children to play. So when your kids want to play with your phone or tablet, don't worry. With our stunning graphics, quality content, (and don't forget FUN-filled design), your device and their time will be put to good use with any of our Learning Gems educational apps! Word Hunt is a classic word search game brought to you by Learning Gems! With a steampunk artistic style, we give you 50+ Categories to choose from and 3 levels of difficulty! Not enough? That’s not all you get! Our unique word search game also allows you to CREATE YOUR OWN Word Hunt lists! Spelling Space Word Search is a classic word search game brought to you by Learning Gems! We have taken all of the Spelling Lists from our popular Spelling Space line of games and brought them into Spelling Space Word Search. This app includes 175 Word Search Lists that range from first grade to the sixth grade level and a stunning space alien theme that kids will really enjoy playing! The Search is on in the Apple iTunes App Store! 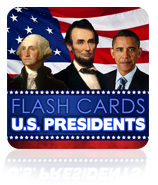 Flashcards – United States Presidents is a wonderful learning tool that helps children learn about the leaders of our country. It’s also great for adults who want to brush up on their U.S. Presidential knowledge. This educational app teaches basic facts and trivia about United States Presidents, such as chronology, dates in which each President served in office, photo recognition, and popular nicknames! We’ve added 8 new levels featuring dollar bills to My Piggy Bank – bringing this wonderful learning app to 16 levels of gameplay, each with multiple rounds per level! We’ve updated our coins to now include all of the 50 state quarters, as well as the new nickel and penny. Help!! Your mission is to rescue adorable penguins who have fallen through the ice! They keep getting trapped inside an ice cavern with no way to escape. Use your awesome brain power to solve the word puzzles by throwing snowballs at the icicles attached to the cavern ceiling. Select from multiple categories or choose "random" for an even more challenging game! Visit the Penguin Village to interact with the penguins you've saved and don't forget to visit the rescue center to find out which ones still need to be rescued! School is back in session! That means it’s time to focus on spelling. If you have a fifth grader be sure to check out this app! 28 lists. 556 high frequency fith grade words. Aliens, lasers, and shooting asteroids at spaceships. This app has it all. If you have a third grader this spelling app is for you! Learning Gems’ newest educational app Spelling Space - 3rd Grade includes a pre-recorded list of 480 High Frequency words that are perfect for third graders. We have divided these words up into the same exact lists and order in which they were given in an actual school! This app works on ALL tablets and is perfect for Kindle Fires and Color Nooks. If you have a second grader this spelling app is for you! Spelling Space - 2nd Grade includes a pre-recorded list of 480 High Frequency words that are perfect for second graders. We have divided these words up into the same exact lists and order in which they were given in an actual school! This app works on ALL tablets and is perfect for Kindle Fires and Color Nooks since those devices do not have internal microphones. If you'd like the ability to record your own lists you will want to check out our other app Spelling Space - Ultimate! This wonderful new Learning Gems app takes the classic "memory" game and amps it up a few notches. Filled with tons of cute, colorful animals - it's perfect for keeping young children engaged and entertained while improving their cognitive learning skills. There are three modes of gameplay which allow users of all ages to enjoy a fun challenge. We've taken this app to the next level with our additional gameplay modes! Aside from classic mode, you can play in anti-gravity and shuffle mode! You've never played memory like this! Memory Animals is getting a new name of Matching Fun - Animals.